Next in the series on Jeff's Famous Jerky is this Sweet Teriyaki variety. 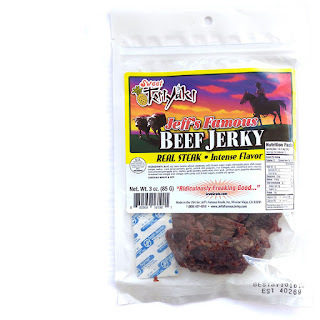 Jeff's Famous Jerky is owned by the company of the same name, based out of Big Bear City, CA. Jeff Richards has been making beef jerky since the 1970s perfecting his recipe year after year. His love for cooking took him into the restaurant business for over 20 years. He currently runs a consulting company called Creative Business Adventures where he helps entrepreneurs achieve success. Jeff says he obtains a higher grade of beef than what many other brands use, and draws from his experiences in the restaurant business to obtain higher quality ingredients as well, explaining this is why his jerky priced higher than others. Beef, soy sauce, sugar, pineapple juice, chili sauce, vinegar, spices, sesame oil. The first thing I taste from the surface of these pieces is a heavy sweet flavor, with some fruity notes, perhaps from the pineapple juice. I can pick up some light garlic too. The chewing flavor starts with some natural meat flavors, and then I can pick up some of the soy sauce. For being dubbed "Sweet Teriyaki", it certainly is sweet, very sweet. As for the teriyaki part, it seems to hold up. I can pick up the soy sauce flavor in the chewing, but only after much of the sweetness has faded away. The pungent quality that teriyaki usually gets from ginger seems to come from a touch of garlic but just slightly. There's also a slight tanginess, perhaps from the pineapple juice and vinegar. While this teriyaki does seem to hold up as teriyaki, it seems weaker on the pungent and tangy components that what I typically enjoy. I do also pick up traces of that sesame oil, which seems to add a little more of an asian character. But if I were to snack away on this without analyzing carefully what I'm tasting, it largely comes off as heavily sweetened jerky, than it does teriyaki. The natural meat flavors come through in this at a light to moderate amount, once much of sweetness has worn off. There's a little bit of that fatty flavor that I also found in Jeff's Original variety. Despite the "chili sauce" ingredient, I don't really taste anything resembling chili sauce, nor anything spicy. The level of saltiness in this seems to be moderate. Overall, what you're going to notice in this is a thick sweet flavor that eventually parts way to a combination of natural meat flavors and soy sauce. You'll pick up lighter amounts of ginger, some fruity pineapple, and a tanginess, that seem to help round out the overall teriyaki flavor. These appear to be slices of whole meat, sliced into strips of varying from 3 to 8 inches long, and sliced to a medium thickness. This is a moist jerky, with a sticky surface feel. These strips are very soft, and very flexible. They chew very easily. The chewing texture starts off feeling soft and tender with no chewing resistance. It seems to only take about 10 seconds before it's rendered into a soft mass. At that point, it has a steak-like feel, but very soft, not necessarily mushy though. Most of these strips have noticeable streaks of fat, mostly as marbilized fat. I don't see any tendon or gristle, but I do get a good deal of stringiness, and some of that stringiness remains in my mouth as unchewable wads of tissue. Even though there's a sticky surface feel, it's not really that messy eating. My fingertips do pick up a faint sticky feel, but still dry enough to type on my keyboard. Jeff's Famous Jerky sells this Sweet Teriyaki variety from it's website at a price of $20.95 for a 3 pack, with each package at 3oz. Add to that shipping of $6.50, and it works out to a price of $3.05 per ounce. For general jerky snacking purposes, at the $3.05 per ounce price, it's a fair value. I get a decent amount of snackability from its overall good flavor and easy chewing, and decent chewing texture. That price is a lot higher than what you pay for major brands of jerky in grocery stores, but it's still clearly a better jerky. As a Sweet Teriyaki variety, at the same $3.05 price per ounce, it's a weak value. In comparison to all the other teriyaki jerky brands, the teriyaki flavor seems comparable to much of its gourmet competitors, though still better than the major brands like Jack Link's and Oberto. But in my opinion, I think you can find comparable teriyaki flavor at a lower price through other gourmet brands. 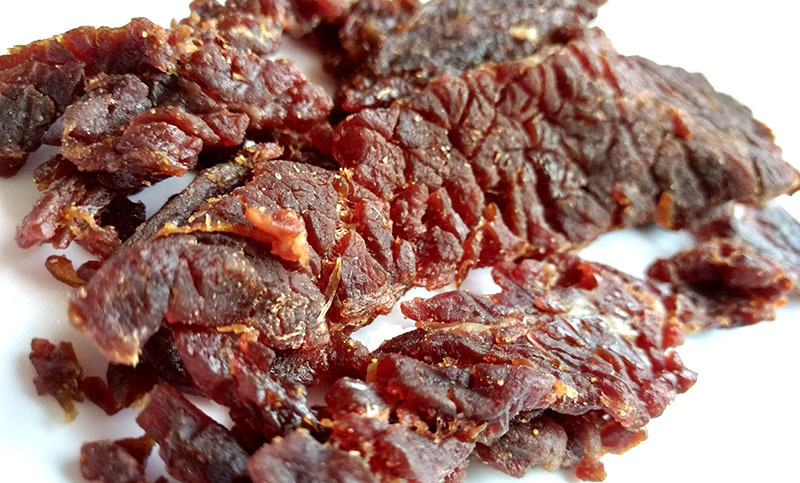 This Sweet Teriyaki beef jerky from Jeff's Famous Jerky offers a lot of flavor in a soft, moist chew, noted by a thick sweetness, along with some natural meat flavors and a noticeable soy sauce flavor. There's some bits of garlic, a fruity character, a tangy quality, and even a slight bit of that sesame oil, all noticeable in small amounts. The teriyaki flavorings seem to do a good enough job to give me the sense that I'm eating teriyaki, but not necessarily provide that "wow factor" that I look for when assigning my highest rating. Overall, the flavor provides plenty of satisfaction to keep me reaching for more, and thereby offers a lot of snackability. 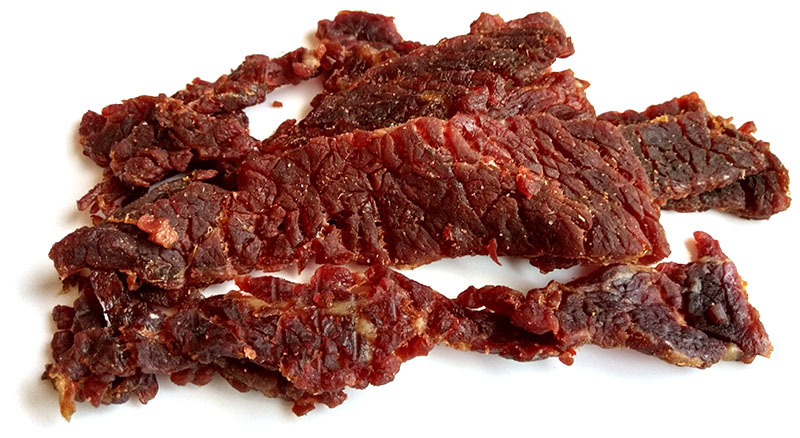 But I think this jerky also satisfies quite well for its meat consistency being very tender, moist, and easy to chew, and definitely adds more to that snackability. My recommended beer pairing for this, try a dark doppelbock, such as Big Bear Mountain Brewing's "Doppel Bock", or Ayinger Celebrator. I would give this and the other Jeff varieties a "best" rating. My girlfriend isn't really a fan of jerky, but she will eat Jeff's. I think the appeal for her apart from the excellent sweet teriyaki flavor is the "ease of chew" factor. A lot of jerkies are a bit tough on the jaws, but the moistness of Jeff's jerky sets it apart from the rest. I would rank this brand at the top along with Couple O' Jerks, Ed's Roadhouse, Jerky Guy, etc. Bob the flavor is good but turns to mushy for my liken maybe thats why your girl friend likes it because it's not to hard to chew, some people like this type of texture but I'm not one of them, It kinda gags me when a jerky sort crumbles and then turns mushy it's not the texture I'm looking for ? If Jeff says he obtains a higher grade of beef than what many other brands use then why does he not list what type of beef he uses. I did taste this brand and it is o.k. but a bit musher than I prefer. I still would like to know the type of beef used. I can tell you over the phone I drive a harley but then if I show you some pic's you will see I drive a bmw. So how can anyone say its better beef than another brand without knowing the cut of beef used. He knows his marketing tricks. I tell you what you want to here and but because it says it you beleave it. In my review I didn't mean to suggest that the moist texture is any better or worse than a dry jerky, or any other texture. I've enjoyed all different types of jerky. I think Jeff's is good for those people that may be a little grossed out by jerky....kind of a beginner's jerky. But I think it's the combination of flavor and texture that make this jerky one that is appealing to a wide range of palates. Premium beef used for Jeff's Gourmet Jerky: No marketing tricks, our label says Premium Beef in large letters... we do not want to reveal what cut of beef it is only to keep this as a trade secret so the competitors don't follow our lead and we can maintain a distinctive product. All our flavors are also totally our recipes and the reasons are same as why many labels will list a combination of spices as simply SPICES instead of listing every spice. The cost of ingredients we use is significantly higher than most jerkys... hence the Gourmet designation, but I will say there are many jerkys that claim to be gourmet, but then don't use premium ingredients... and to me, THAT is misleading advertising. Not listing the exact cut of beef has nothing to do with wanting to keep your "Premium Gourmet Jerky" a trade secret, it has everything to do with wanting people to believe that what you say is better than some other brands. The cut of beef is only part of the flavor. The seasonings and spices are what will set you apart from the rest. So again you do know your marketing tricks. You should not be afraid that someone my want to use the same type of beef if your recipe stands out all on its own. As a consumer I am more likely to buy a gourmet jerky that has full disclosure than one that says they use beef and some seasoning. I do not suggest that you are doing any false advertising or trying to mislead anyone just that people have a right to know what type of beef is used especially because you call it premium beef. Dude! There not asking you for your spice recipe, They just want to know what cut of beef "WOW" Man people like to know what there buying is that so bad? There paying for it! If I want a T Bone Steak I'm sure as hell not going to settle for a pork chop! To me it's seems your trying to hide something what ever man. This kinda turns me off dude. Now I would like to know what cut of beef you use???? ?